Garda and military intelligence units have increased their monitoring of suspected Isis sympathisers based in the Republic of Ireland in an attempt to prevent the spread of violent attacks to the country. Senior security advisers are particularly concerned at the rise in the number of 'lone wolf' strikes on mainland Europe. For some time, officers have been convinced that the most likely threat of an international terrorist incident would emerge from a loner who had been radicalised over the internet. As a result, specialist sections of the Garda and the army have been keeping a close watch on the activities of the listed suspects to determine if they have been involved in either attempting to attract fresh support from vulnerable young people now living here or encouraging others to become involved in violence. The growing frequency of the attacks in countries such as France and Germany is also being kept under review by Taoiseach Enda Kenny, Tánaiste Frances Fitzgerald and other relevant government ministers. A spokesperson for Ms Fitzgerald said Ireland "cannot consider itself immune from the threat posed by international terrorism and extremism. "There is no specific information in relation to any threat to Ireland from international terrorism. The level of threat is kept under constant review by An Garda Síochána, particularly in the light of ongoing developments." A full-time Garda liaison officer based in Ireland's embassy in Paris is liaising with his French counterparts. "Combating terrorism is a top priority for the Tánaiste and the additional €55m provided to An Garda Síochána a few weeks ago took into account the extra demands arising from measures to deal with the threat from international terrorism," the spokesperson said. The threat level in the Republic had been raised from low to moderate early last year in the wake of the Charlie Hebdo murders in Paris. It has not been changed since then, despite the Bataclan and other attacks on that city in November and subsequent atrocities. 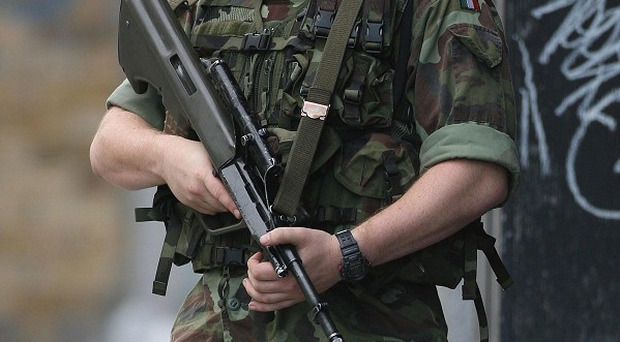 Ireland has vowed to play its part in the EU response to jihadi terrorism and the onus is on the Garda anti-terrorist units and military intelligence to keep a tight watch on the movements and contacts of the small group of Isil supporters based in this country. Ireland has been used in the past as a base for logistics support, with sympathisers raising funds, providing crucial documentation - such as forged passports and identity cards - and helping al-Qa'ida activists who wanted to lie low for a while. Gardaí are also in regular liaison with their counterparts in both in the UK and continental Europe in relation to tracking the movements of suspects and sharing intelligence. This sharing played a role in preparing a dossier on a Jordanian man, who has since been deported after he had been deemed to be a focal point for recruiting extremists to fight in Syria. Security measures already in place at airports and other possible areas for attack have also been put under review and, where deemed necessary, have been reinforced. Members of elite counter-terror units, including the Garda emergency response unit and the Army Ranger Wing, as well as other key components, like the military ordnance section, have been training together on how to combat the jihadi threat. An agreement signed by the Department of Justice and the UK Home Office has significantly boosted port security by giving the go-ahead for the exchange of details of passenger lists for all airline and ferry companies operating within the common travel area. Meanwhile, Defence Minister Paul Kehoe has said there is still just "a low to medium" threat from Islamic extremist terrorism here following the "scary" attacks in Europe. He told the Irish Independent: "We're in a changing world. What we have seen and witnessed both on television screens and written media and radio media over the last few weeks, it's absolutely scary stuff. The world is changing but An Garda Síochána and the Defence Forces are very well equipped to deal with whatever eventuality may arise. "But let me state also that we are at a low to medium risk here. We are an island nation and at the same time we have to be ready for every eventuality. "We have people assessing this on an ongoing basis with An Garda Síochána and the Defence Forces. We are ready for any eventuality that may arise. "I'm confident of the advice I'm getting from the Defence Forces that we are at a low to medium risk."